Happy Friday! We love to feature the work of Jennifer Mauricio here on our blog, she has done yet another gorgeous piece for us today! Happy Friday once again… and we hope everyone is ready for one last hurrah of summer this holiday weekend (though if summer hangs around for another month or two, we won’t be too upset)! Here are some bright orchids and sweet script from Sarah to kick things off for you. Enjoy! Good morning! 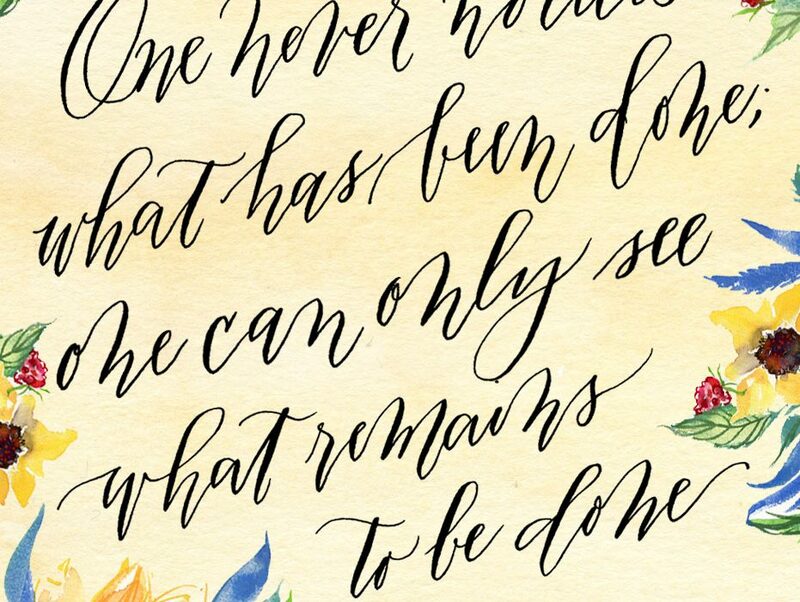 So pleased to feature Mallory Hopkins for our Painterly Prose Calligraphy once again. Thank you for sharing your talents with us Mallory! Good morning all! Another less-than-sunny Friday to kick off our weekend here, but we thought we would brighten things up with some colorful summer sunflowers. We love to show off the elegant work of Laura Hooper, and what a great insight today from Marie Curie, who accomplished so much.